The Raiment of a Thousand Storms Set Dungeon is located in Act I, The Old Ruins. Simply take the waypoint and walk a bit to the northeast — the entrance to the Raiment Set Dungeon will appear if you have the 6-piece set bonus active. The Inna's Mantra Set Dungeon's two unique Primary Objectives are to: 1) Reach the Golden chest at the end of the dungeon in under 2 minutes; and 2) Do not get hit by a single Succubus projectile. 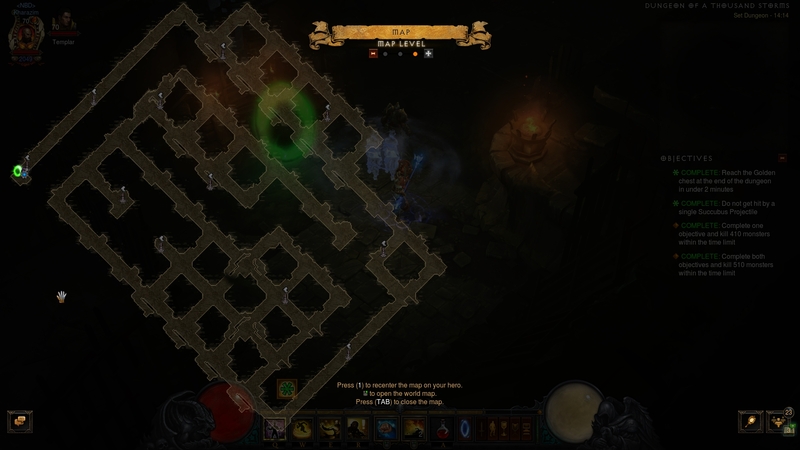 The Raiment Set Dungeon is a sewer tileset that is unique in its design and purpose, one of the few Set Dungeons where the layout itself is part of the challenge. A proven attempt path is to beeline straight for the center of the dungeon (picking up Speed Pylons on the way) and ignoring most of the side areas, then backtracking to finish off the remainder monster killing objective. Ravenous Dead, Walking Corpses and Decayers — You will pad out the monster slaying counter mostly with this slow moving, harmless filler trash. Succubus — few and far between, these crafty demons will stay at range and fire slow moving, homing projectiles that will cause you to fail the 2nd Objective. Be vigilant of their appearance on the map, and try to Dashing Strike over their projectiles and onto them, finishing them off quickly. Equipping the Nemesis Bracers and cubing an In-geom will allow you to make even greater use of the Speed Pylons on the map. Note that unlike most Set Dungeons, this one does not have naturally spawning elites to trigger In-geom cooldown resets (useful when you want to move fast), so the Nemesis Bracers allow you to create some of your own. This has the added benefit of adding extra monsters to the dungeon that are right in your path and that will count towards the final tally, eliminating the necessary backtracking at least partially. It was mentioned in the previous section, but it is worth repeating — rush for the Golden chest at the end of the dungeon first! On your first time around the dungeon, focus just on picking up the Speed Pylons and killing the trash that is directly in your way. When properly executed, this will get you the 1st Objective easily and you will only have to backtrack 1/2 of the dungeon to finish off the counter. Cooldown and Resource Cost Reduction are key for this Set Dungeon, since you will be trying to Dashing Strike as much as you can; in a Raiment 6-piece build, this makes Dashes both a damaging skill and a spender. Using the fire rune Radiance makes more sense over the traditional speedrunning choices like Way of the Falling Star because of the potential for RCR from Cindercoat. Getting 2-piece Innas into the build (via the weapon and belt) can also be quite helpful for resource restoration, as their bonus will double up the effectiveness of Mantra of Healing Circular Breathing and Mystic Ally Air Ally. 03 Mar. 2018: Added guide.